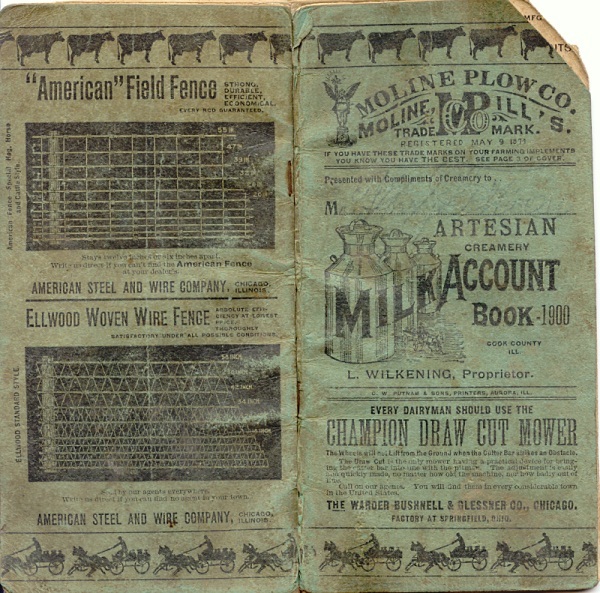 What: “Dairies to Prairies” This free exhibit, presented by the Elgin History Museum, explores the history of the area’s remarkable dairy heritage. At one time, there were over 140 dairies, dairy farms and creameries in a 50-mile radius around Elgin. Now, there are only three dairies left. When: Saturday, March 23, at 1 p.m.
For more information, call Sue at 847-781-2606. Last week we posted a series of photos from a small booklet that was published for the tenth anniversary of Hoffman Estates. The 1969 booklet was titled “Community From Cornfields.” This week we’ll continue with photos that are centered around some of the District 54 and District 211 schools, and a few of the larger retailers that opened in Hoffman Estates during its first ten years. Blackhawk Grade School opened in 1958. It was the second school built in, what would be, Hoffman Estates, following Twinbrook Grade School. 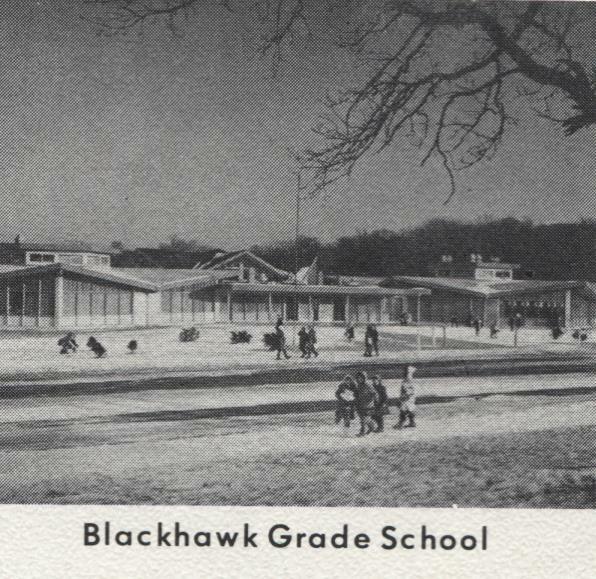 A history of Blackhawk School can be found in an earlier blog posting. It closed in 1976. 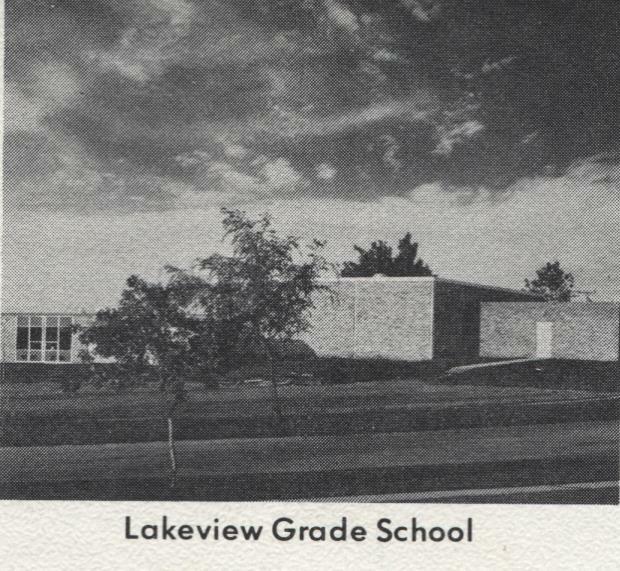 Lakeview Grade School opened the following year in 1959–the same year the village of Hoffman Estates was incorporated. It was built in Parcel C and is on Lakeview Lane. An earlier blog posting discussed the farmhouse that can still be found directly west of the school. Clearly, the site was optimal for both the house and the school. 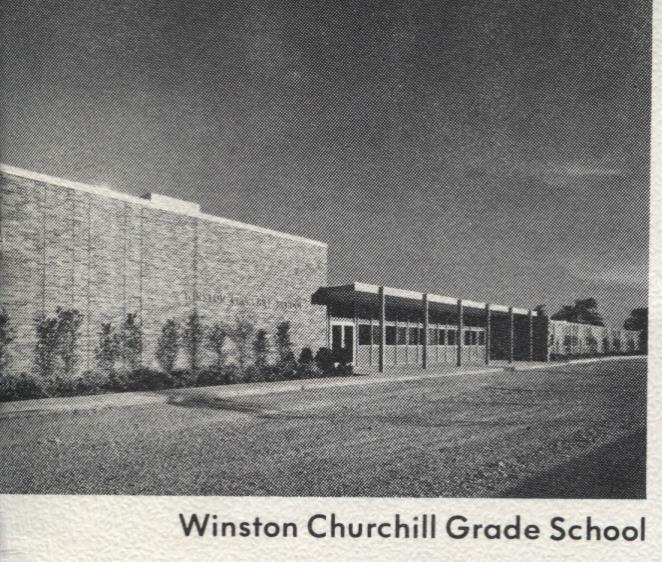 Winston Churchill Grade School opened on Jones Road in 1965 to serve the children of the Highlands subdivision. 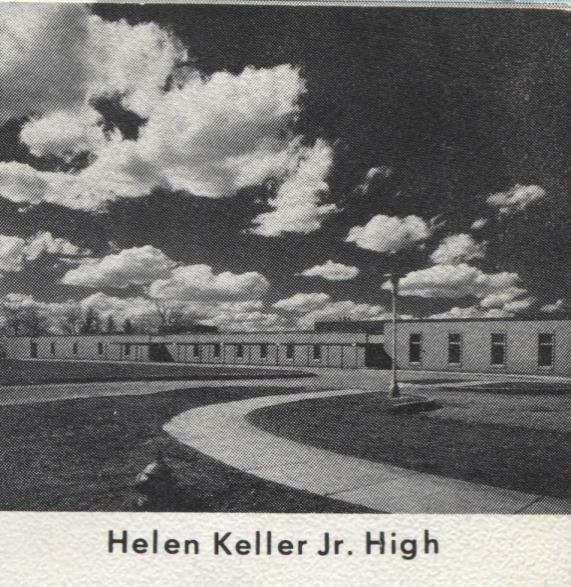 Helen Keller Junior High opened in 1967 and was the second junior high in the district, following Frost Junior High. By 1969 the school district’s offices had moved into trailers next to the school. Conant High School opened in 1964 and was the first secondary school in the township to serve students who lived in both Hoffman Estates and Schaumburg. Fremd High School (the insert) opened in 1961. All Hoffman Estates students north of the tollway attend Fremd. This wonderful photo gives us a bird’s eye view of the first Jewel that opened in Hoffman Plaza in the summer of 1959. It was a much needed grocery store for the new residents of Schaumburg Township. With that iconic water tower behind the grocery store you can tell that the orientation of the shopping center faces south towards Higgins Road. You can also see a barber shop off to the left with other stores in between. Maybe some of you can identify what they would have been in 1969? If you know Hoffman Estates history at all, you recognize this building as the Fireside Roll Arena which opened in 1975 after the booklet was published. This is actually its predecessor, the Magna Mart department store, that was built for this location and opened in May of 1968. Their advertisement in the May 3, 1968 paper said that they had 52 departments that included: clothing, home furnishings, electronics, paint, jewelry, records, sporting goods, patio, family shoes and a snack shop to name a few. They did not last long and seem to have closed their doors sometime in 1970 or 1971 as there is nothing in the paper beyond February 1970. Does that sound correct? Last, but not least, this gem of a photo captures three businesses that were the heart and soul of early Hoffman Estates. The brick building to the left is the Thunderbird Theater which opened in 1966. The business in the center of the photo is Grant’s, a one-stop shop department store for the entire family and, off to the far right is the National Food Store. Both Grant’s and National opened in the Golf Rose Shopping Center on October 17, 1963. By the time this photo was taken in 1969, they were fixtures and had been there for six years. What a wonderful discovery this booklet has been! Next week you will have a chance to take a quiz on the churches of Hoffman Estates. This time, I’m leaving the identifications all up to you! In December 1959 the first Campanelli home was finished in the “W” section of Weathersfield and Ray and Carmella (Carm) McArthur moved in. They were the first in a long line of Weathersfield owners that extended into the late 1980s. Ray was employed by Motorola, initially at their Franklin Park campus, and later in Schaumburg where the corporation established their headquarters. The couple didn’t let any grass grow under their feet and proceeded to get involved in the brand new village of Schaumburg. Carmella worked at both the Ben Franklin store and W.T. Grant store in Hoffman Estates. Later, in 1965, the couple opened Carmen’s Colonial Restaurant in the brand new Weathersfield Commons at Springinsguth and Schaumburg Road. A Daily Herald ad for Carmen’s from June 4 of the same year mentions their specialty in Italian and American food for Dine In or Carry Out. The restaurant was in business until 1967. You can see portions of the menu below. It was quite extensive and reasonable–complete with a soda fountain, no less! Ray served on Schaumburg’s Plan Commission for more than 12 years under Mayor Bob Atcher. In addition, Ray and Carm were also actively involved in St. Marcelline Catholic Church. Ray was head usher and a deacon, and Carm was one of the volunteers responsible for counting donations on Sundays and holidays. Their son, Richard, moved with them to Schaumburg and built his own house in Weathersfield with his new wife, Mary Ann. 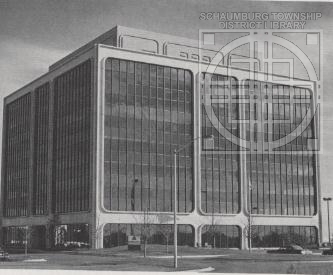 They opened McArthur Realty in 1971 and had offices at 1635 W. Wise Road and 1407 W. Schaumburg Road. It was an active, busy realty company that served the greater Schaumburg Township area. To promote their company, they ran radio ads on some of Chicago’s major radio stations. Thanks to the McArthur family, you can listen to one of those ads here. The radio spot advertised McArthur Realty’s involvement in the Weathersfield Lake Quad Row Homes in Schaumburg that were being developed by Campanelli. It came complete with membership in the Nantucket Club which gave owners access to the clubhouse, gameroom and swimming pool. The realty office closed after Richard passed away in 1976. Before Richard’s death however, he and Mary Ann were also very involved in community affairs. Richard was one of the first Schaumburg Jaycees and Mary Ann was a Jayceette. They helped put together The Shindig which was a predecessor of Septemberfest. Richard also served on the Schaumburg Kings board. Another branch of the McArthur family was also instrumental in the development of Schaumburg. Ray’s step-brother, Wayne, and his wife, Carol, moved to Schaumburg with the intent of establishing a Methodist church. Campanelli became aware of this situation and donated a house on Springinsguth Road to serve as both a temporary church and house for the McArthurs. When their house on Sharon was finished, the congregation then began meeting in the Jennings house and, later, in The Barn. Our Redeemer’s United Methodist Church formally opened its doors in 1970 on the northwest corner of Schaumburg and Springinsguth Roads. The church remains there nearly 50 years later. 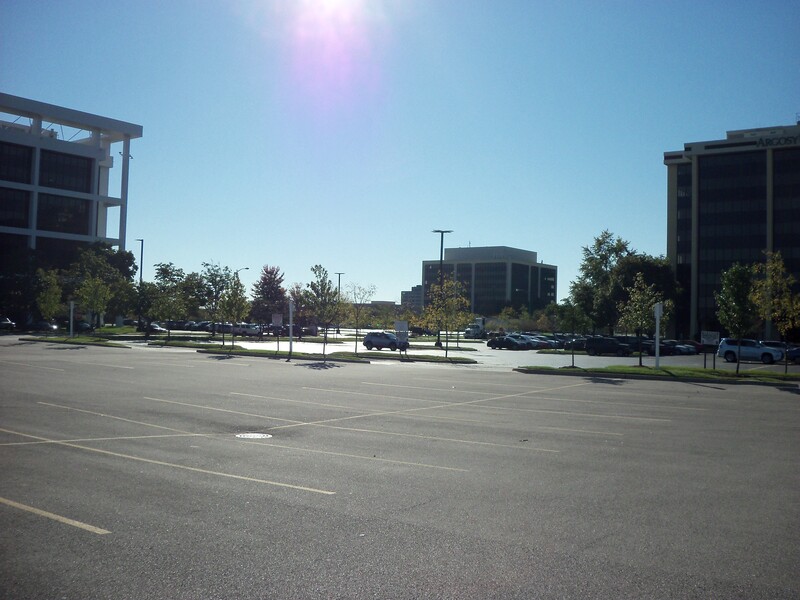 The beginnings of Schaumburg and Hoffman Estates were busy times. The many young families who moved to the area immediately got involved establishing businesses, organizations and churches. Multi-generational families such as the McArthurs were definitely unusual in the early days. Schaumburg Township benefited all the more because of the passion of Ray and Carmella, the younger Richard and Mary Ann, as well as Wayne and Carol. 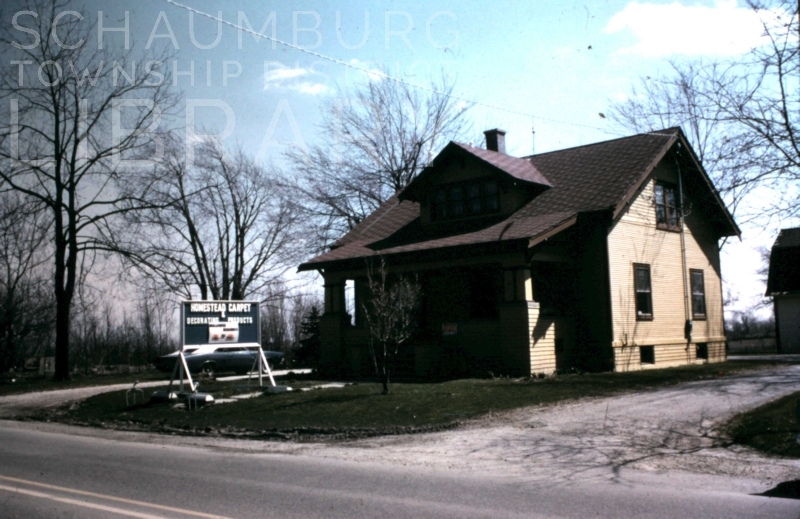 In fact, to this day, members of the McArthur family still call Schaumburg Township home. 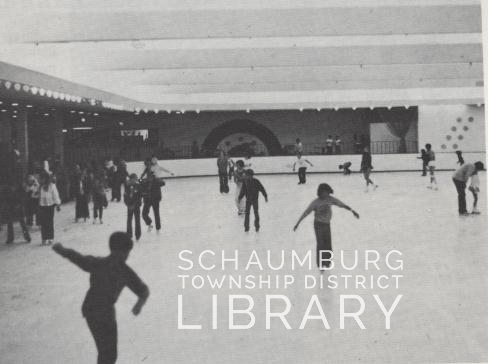 They have all been instrumental in raising Schaumburg into the village it would become. 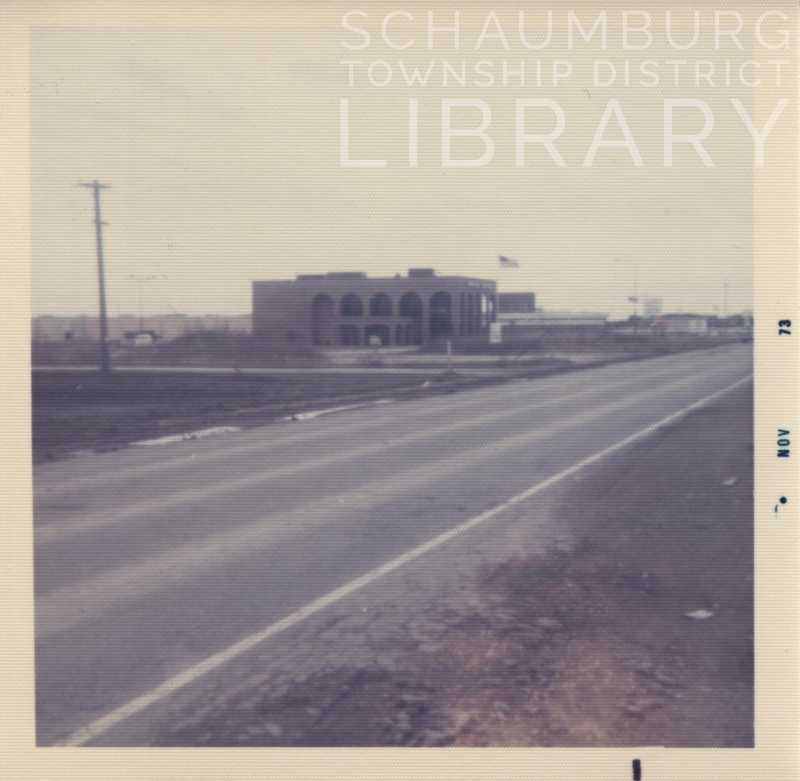 I would like to extend my sincere gratitude to Mary Ann Russell and her son, Scott McArthur, for contributing photos and information about the early days of Schaumburg. They came to talk to me in 2014 with their photos in hand and, about a month ago, passed on the radio ad and the restaurant menu. They had mentioned these items in their earlier visit and, the fact that they remembered four years later, is amazing. Justin Teschner, who is a grandson of Wayne and Carol, also stepped in and contributed wonderful details about their family’s contributions. The McArthur family hasn’t stopped giving and it is appreciated! This charming little school at Schaumburg and Roselle Roads served as one of the five, one-room public schools in Schaumburg Township. 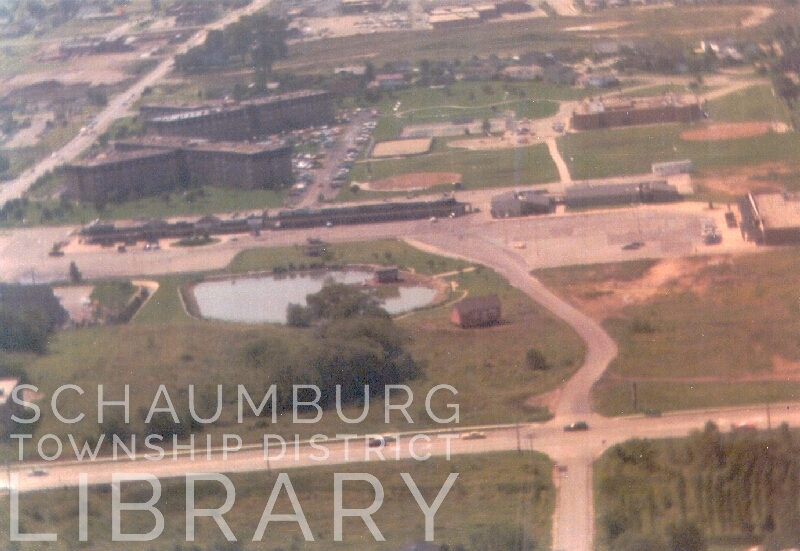 It remained Schaumburg Centre school until January 1954 when students in the township began attending the newly built Schaumburg School on east Schaumburg Road. When that happened, the school building entered its second phase and was rehabbed to accommodate a series of businesses. With its central location in the township, it was a prime spot for small businesses to get a start. As a result, for the next 26 years it housed everything from the R.I.C Delicatessen to a wrought iron store to three different realty agencies. The photo below, taken in 1978 or 1979, was contributed by local realtor Bob Dohn when it was Koenig & Strey Realtors. The sign to the far left clearly shows a portion of the long time Koenig & Strey logo. This realty agency was preceded by FBK Realty and Kole Real Estate. According to Mr. Dohn, “Kole Real Estate [was] a well-known local real estate company in the 1970s that was started by Robert Kole. 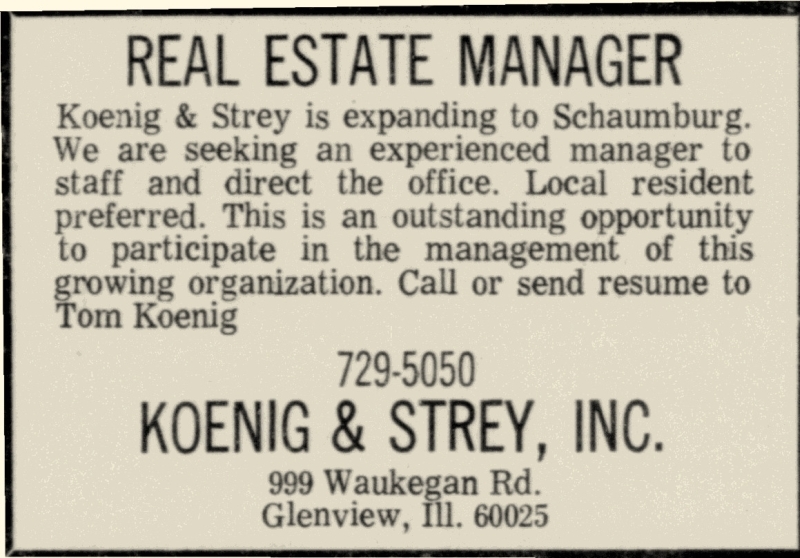 When I worked in the building, Koenig & Strey was a well established, family-run firm from the north suburbs that made a foray into the northwest suburbs in the late 1970s. The office began operating in September 1978 according to a March 8, 1979 issue of the Daily Herald. Mr. Dohn said, “Koenig & Strey had plans to build a shopping center on the site, much like the current Schoolhouse Square that was later developed by Terry Bolger. The idea was to build the new center around the schoolhouse, then move our offices into the new space and donate the schoolhouse to the historical society, who were to move it to its current location by St Peter’s Lutheran Church. This site was across Schaumburg Road in Town Square. You can see the red school next to the pond in the photo below. In a time when open commercial space was valuable, it is telling that three realty agencies took advantage of the real estate mantra “Location, Location, Location” and moved into our township’s centrally located, one room school. What a prime spot! It was based on the Parker Brothers’ Monopoly game, and featured an array of 46 businesses and governmental bodies. Moving your game piece around the board, it was possible to “land on” any one of these entities while playing. Bill Tucknott, who has been an active participant on a number of Schaumburg’s different boards and commissions, shared the game with me. He and his family purchased the game when it was first introduced to the community. In a December 23, 1981 article from the Janesville Gazette, it states that the game was “the brainchild of David A. Colbert, a young Oshkosh [WI] entrepreneur who is founder and president of Citigames of America Inc.” According to the Wisconsin Department of Financial Institution’s website, the company was founded in 1980 and dissolved in 1993. Mr. Colbert’s original game was for his hometown, the city of Oshkosh, WI. The company then began soliciting other cities and villages with the hope of designing similar games for towns across the country. 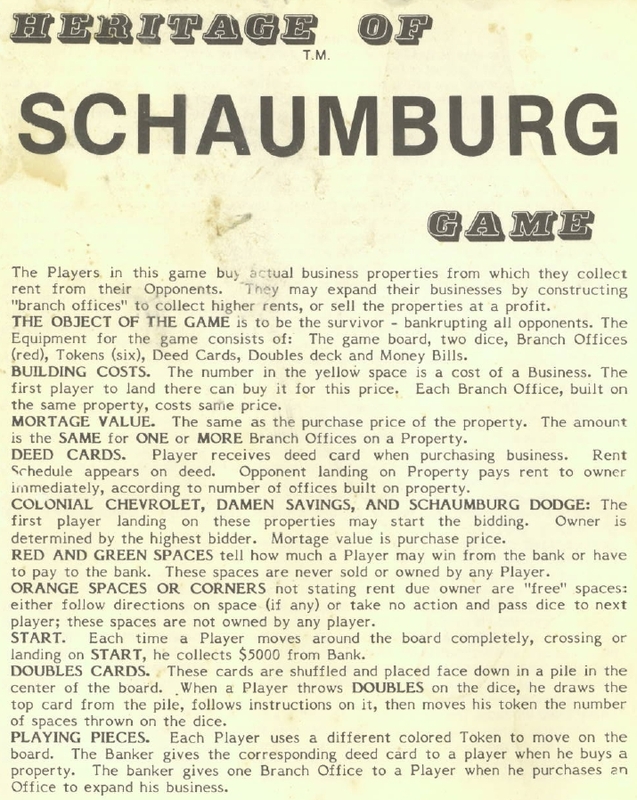 The Schaumburg game was copyrighted in 1983 so it would have been one of the earlier games developed. It is quite an interesting to note the local businesses that were willing to contribute advertising money to the game’s developer in exchange for their appearance on the game board. Is it possible the amount they contributed was in correlation to their monetary spot on the board? Below is a list of the businesses and governmental bodies that appeared on the board. We’ll begin with the Start spot and move around the board from there. 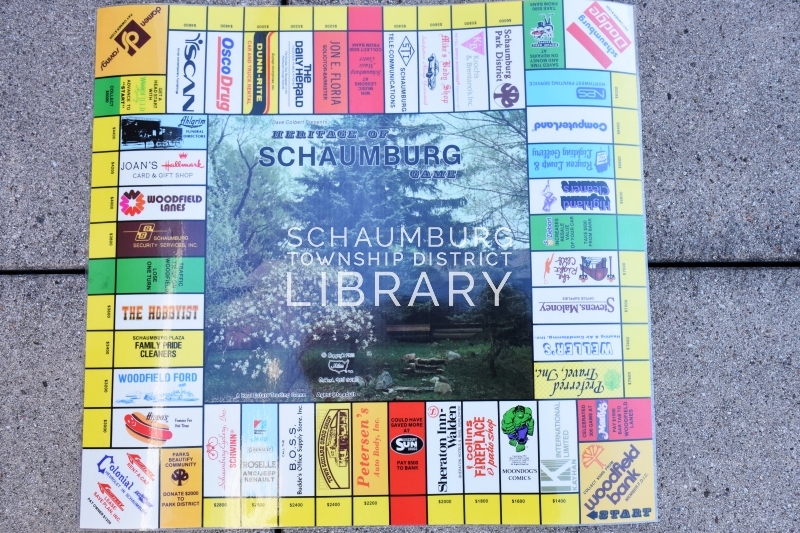 It’s obvious a number of the businesses such as Damen Savings, Woodfield Lanes, Kroch’s & Brentano’s, Hippo’s, Moondog’s Comics and SCAN no longer exist but there are definitely some that can still be found in Schaumburg or the area. Ahlgrim’s, Osco Drug, The Daily Herald and the Schaumburg Park District are the ones I recognize right off the bat as still being in business. Those with an asterisk were highlighted in the directions for the “Heritage of Schaumburg” game. If you have any details regarding when any of these businesses opened and/or closed their doors, or if they merged or changed names, please leave a comment or send me an email. I’d be happy to update this blog posting. An ice rink in a mall? Where else but Woodfield? Less than two months after the mall opened in September 1971, an ice skating rink was already being considered by mall management as a unique attraction for their customers. As part of the Phase II construction, an additional 300,000 square feet of space was in the works. It would include Lord & Taylor, 30 retail shops and the skating rink. This would create another entire wing at Woodfield for the nearly full mall. Interestingly enough, at that time, the Taubman Company also operated additional skating rinks at some of its other malls in California! 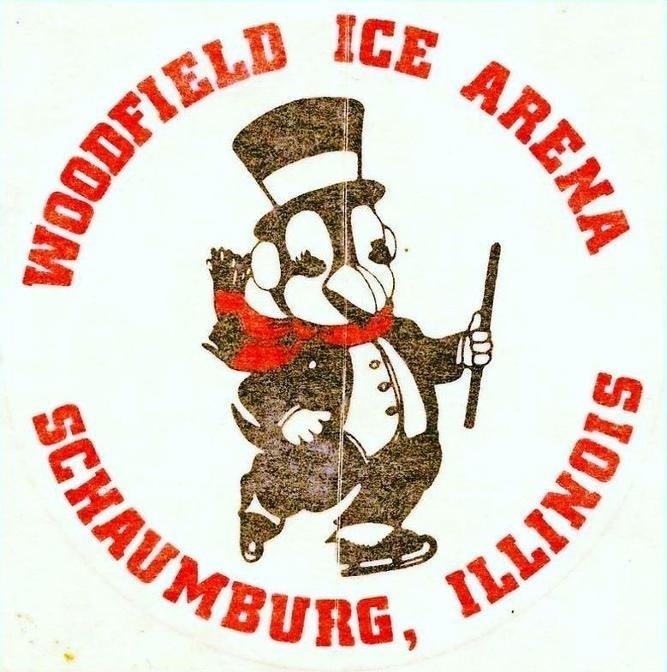 Later advertisements that appeared in the March 17 and April 21, 1981 issues of the Daily Herald highlighted the fact that the Woodfield Ice Arena was the only indoor skating rink in the Chicago area located in a shopping center. Public skating sessions were offered every day of the year as well as classes. Lessons culminated that year in a gala Ice Show with a western theme. Potential skaters were encouraged to contact the rink’s manager, Bill Krzyston. Other features at the time were men’s night, family night, ladies night and date night as well as Adult’s Coffee Club on Tuesday mornings. 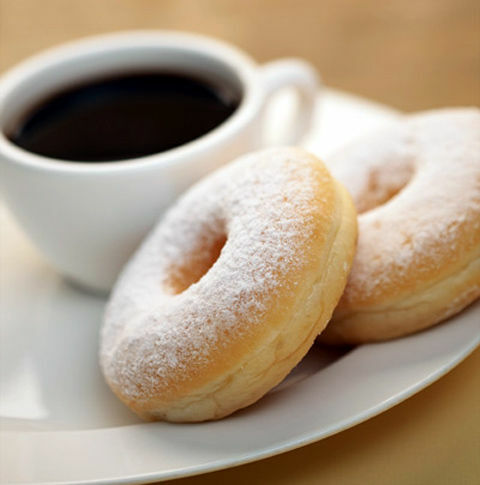 The Club featured a half hour lesson followed by coffee and donuts. In addition, they also advertised their group rates for all types of parties. Unfortunately, the fun on the ice did not last much longer. In a Daily Herald article from September 3, 1984, it was announced that the Ice Arena would close on October 19 after 11 years in operation. The rink had been doing poorly for its last few years of operation so it was only a matter of time. The large space, however, was too valuable to go unused for long. Less than a year later, the Woodfield Mall Theaters opened on June 21 and featured five new theaters run by Plitt Theaters. From a bright, wide open ice rink to five dark movie theaters, the venue definitely changed its theme in a matter of eight months! The new screens opened with area premiers of five movies. Can you guess the names from these clues? A Disney film based on one of L. Frank Baum’s novels. Ron Howard’s wife, parents and brother all appeared in this movie. This horror movie featured a musician and an actress who welded by day and danced by night in her earlier breakout movie. The photo of the ice rink was used courtesy of the former Profile Publications of Crystal Lake. Tucked away in the Friendship Village woods, there once stood a small dance pavilion and tavern. It was called Herman-In-The-Woods and was appropriately named for its owner, Herman Somogi. In 1928, Simon Strauss sold the property, with its dance pavilion, to Herman and his wife, Julia. The pavilion structure, based on a loose description by oral historian Ralph Engelking, was a modest dance hall with a wooden floor and large shutters that swung up and opened the building to the nighttime air. Before the Somogi’s ownership the area was called Schween’s Grove and was named for Ernest P. Schween, the original land grant owner of the property. The grove had been used by local people as a bucolic picnic area and, at some point, a dance pavilion was erected on the property. Mr. Engelking, who was born in 1922, remembered his parents going to the pavilion when he was a boy. In an August 10, 1934 issue of the Cook County Herald, there is a mention that Herman Somogi of Palatine applied for a liquor license. This was a year after prohibition ended and the Somogis were probably hoping to capitalize on the potential of a drinking establishment near the center of the township. Mr. Engelking also mentioned that a barrel of beer could usually be found outside the pavilion for those wanting to quench their thirst on dance nights. 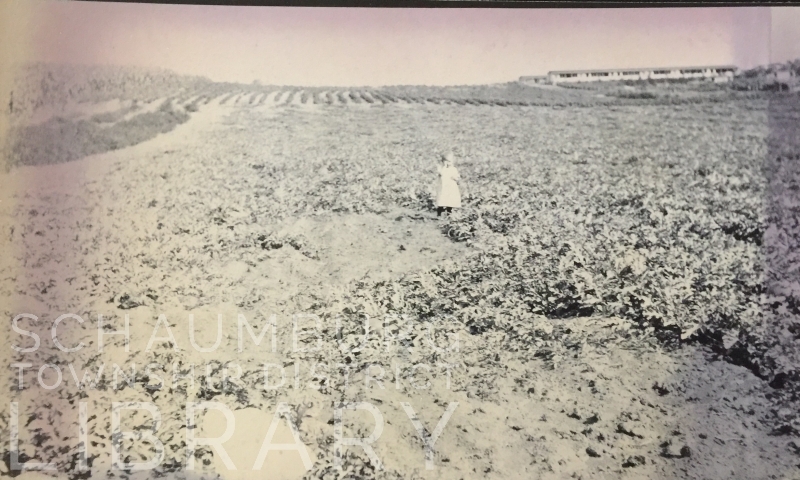 Two days later on August 11, Mr. Somogi and Frank Sporleder, who lived on an adjoining farm, held the “first Schaumburg picnic” in the former Schween’s grove. Music was provided by Heine’s orchestra with “usual picnic attractions.” A week later it was reported in the August 16 issue of the Cook County Herald that the first annual picnic and dance was successful enough that Mr. Sporleder planned another picnic and dance for August 25. The following year, according to a July 4, 1941 article, the Somogis started their picnic and dance season on the Fourth of July. A month later, Mr. Somogi resurrected the Old Settlers Picnic which had been famous 30 years prior. Again, Heine’s seven piece orchestra provided the music. 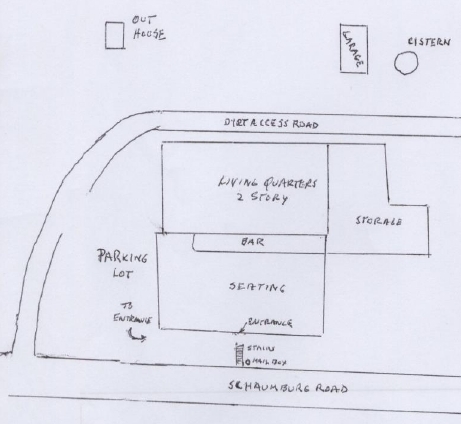 Despite subdivision and hospital possibilities that were later suggested for the property–and did not come to fruition–it was Friendship Village that inevitably purchased the acreage. They opened their doors in 1977 behind the woods that contained the hidden dance hall and tavern. And hidden it was. It was virtually nonexistent in the May, 1959 phone book. Mr. Somogi was listed, but not his establishment. Not Herman-in-the-Woods. Not The Topside Inn. It was definitely a small part of our history that tried to go missing but did not succeed! 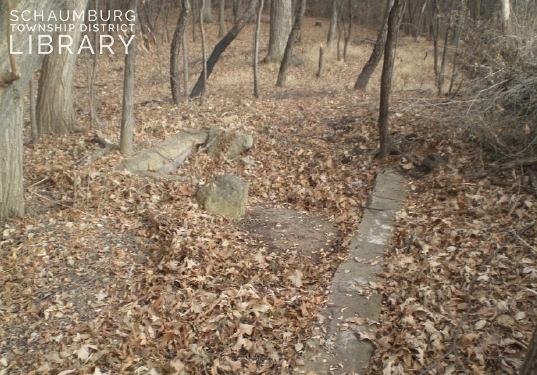 Some of the information in this blog posting, as well as the photos of the concrete footings and the map of the tavern premises were provided by Herb Demmel in his document called The Ownership of Sarah’s Grove that can be found on the library’s Local History Digital Archive. I thank him for his work! For years it was called Maggy Magoo’s. And before that it was known as The Homestead House. It’s the house on the right and it was a home shoppe that offered a wide variety of home accessories, decorations, gifts and floral arrangements for a variety of occasions. You can still find the building at 105 E. Schaumburg Road even though the business is gone. The craftsman style bungalow was built in the late 1920’s by Louis and Hannah Schoenbeck who had farmed in Schaumburg Township after they married in 1897. 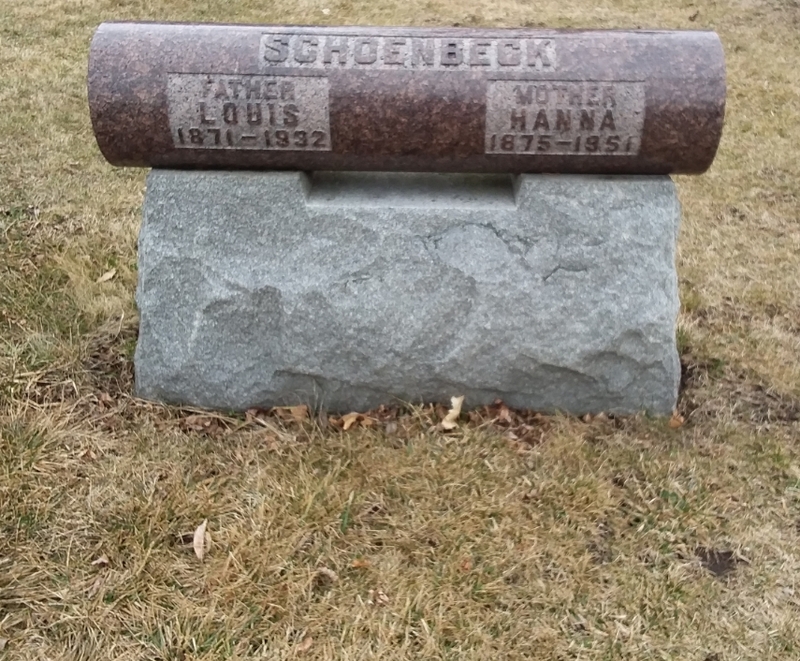 Louis was born on a farm north of Arlington Heights and Hannah Freiberg was born in Germany and settled in Schaumburg with her parents. After their marriage, as stated in Louis’ obituary, they lived on their farm for 31 years. That farm was on the east side of Roselle Road, between Schaumburg and Wise Roads. They must have rented for a time from the owners, H.C. and Wilhelmine Thies. A record from the April 2, 1910 issue of The Economist: A Weekly Financial, Commercial and Real Estate Newspaper states that Louis Schoenbeck purchased the 260 acres from Wilhelmine on March 21, 1910 for for $22,ooo. While on the farm they raised their four children: Henry, Minnie, Edward and Clara. When they retired from farming in 1928, they bought some property in “downtown Schaumburg” and built the home you see here. In addition they built the small barn that still exists, a chicken house and a smokehouse. Their property line abutted the Panzer house which was due east and has since been updated and realigned to face west. When Louis died a few years later in 1932, Hannah remained in the house with her son, Henry, until her death in 1951. Henry then married Katie Wachman in 1954 and they resided in the house until his death in 1966. At some point, between their marriage and Henry’s death, the couple either sold or gave a 1/2 acre parcel to the west of their house to Minnie and Arthur Flentge, his sister and brother-in-law. They built a ranch home of their own on the property and lived there with their daughter Lorraine. 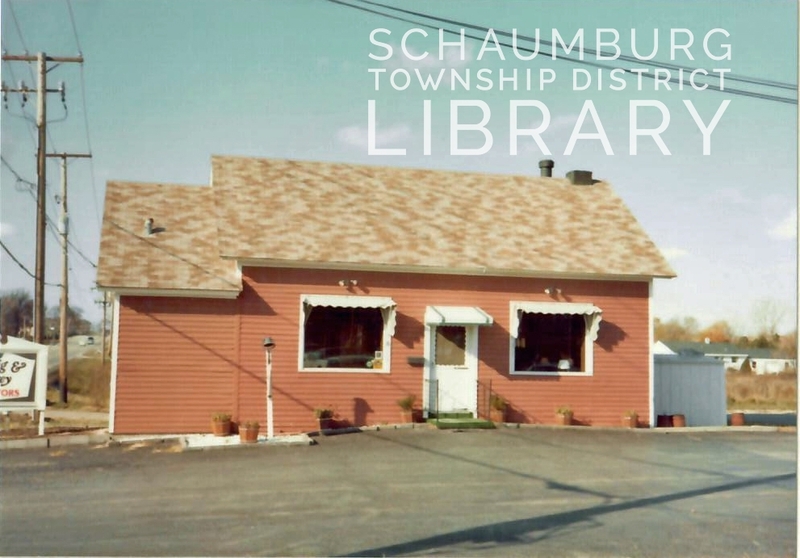 The Village of Schaumburg eventually purchased the property after the deaths of the elder Flentges, giving Lorraine joint tenancy until she no longer needed the home. The home was subsequently torn down around 2015 and remains an open parcel. Meanwhile, the Schoenbeck house and property to the east were sold around 1973 to Albert and Eleonore Manzardo. They had begun a specialty carpet business in 1970 in Weathersfield Plaza called Homestead Carpet. It eventually expanded to include interior design and other decorating services. After purchasing the house, they moved their business there and operated as the Homestead House for a number of years, expanding to include an offshoot business called Country Oak. The house/business space was later leased to Alan and Margy Bedyk in 1992 who changed the name to Maggy Magoo’s Country Accents and Gifts. It operated as such until 2016. In March 2018, a European coffee shop called KaffeeStube opened in the spot. So, from the Schoenbecks to The Homestead House to Maggy Magoo’s to Kaffeestube, this house has stood for 90 years with its unique-for-the-area, craftsman style. A little variety never hurts! Articles from the Chicago Tribune, March 26, 1995 and the Daily Herald, November 13, 1992 were used in the creation of this blog posting. The obituaries of Louis, Hannah and Henry Schoenbeck were also very helpful. WHO WAS MALT MAID AND WHY WERE THEY PICKING UP PUMPKINS? This picture was recently sent to me via the descendants of Florence Catherine “Kate” Bell, who grew up in Schaumburg Township in the 1920’s and 30’s. Her father, James Austin Bell, was, for the times, a voluminous photographer and took many photos of Stratford Farms, a Schaumburg Township farm he managed on Roselle Road that supplied poultry, produce and dairy to the Stratford Hotel in Chicago. This was a prime example of the photos he took. His children often appear in his photos and this one is no exception. A young Kate is sitting on a pumpkin next to a Malt Maid Co. truck that is being loaded. It struck me that it is rather odd that a truck advertising “Made of Malt and Hops” is picking up pumpkins. Malt is made from cereal grains and hops come from the hop plant. Pumpkins don’t fall into either one of those categories. 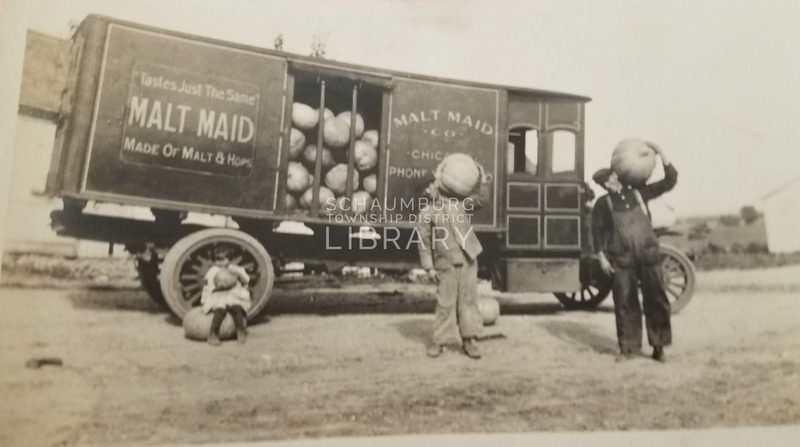 Who was Malt Maid and why was a Chicago company driving all the way to rural Schaumburg Township to pick up a truck load of good-sized pumpkins? It seems that Malt Maid was connected to the Manhattan Brewing Company, a city block sized brewery at 3901 South Emerald Avenue and Pershing Road in Chicago, that was purchased by the infamous mob boss Johnny Torrio. According to an April 24, 1977 article written by reporter Richard J. La Susa of the Chicago Tribune, Johnny Torrio bought Manhattan Brewing, “a brewery of minor importance” in 1919. In The Legacy of Al Capone, author George Murray states that Torrio purchased the brewery in the spring of 1919. This was but a few short months before the Volstead Act was passed in October that gave us prohibition. 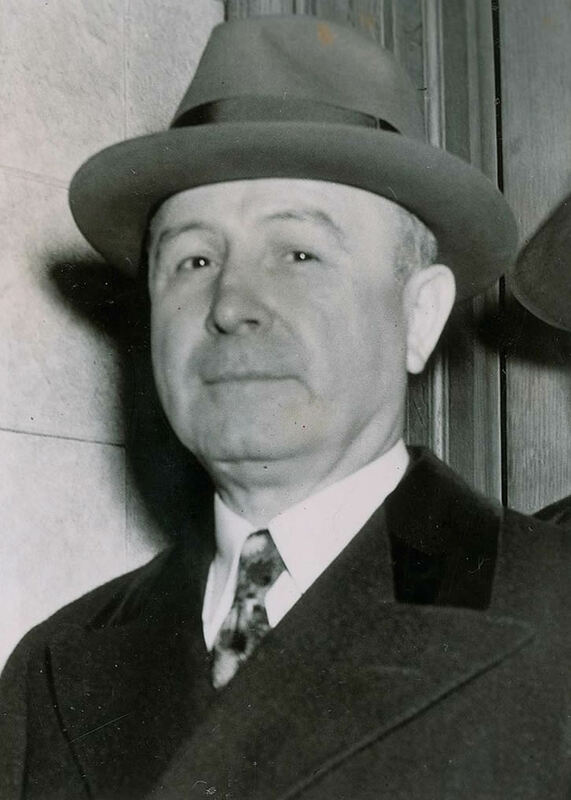 After Torrio bought the brewery, La Susa states he “changed the name of the business to Malt Maid and controlled it until 1924, when he was forced to ‘retire’ from the Chicago scene by a faction of his mob led by Al Capone.” The timing of the name change differs in various articles and books used as research for this posting, but it is universally agreed that Malt Maid was also co-owned at various times by other mob bosses Dion O’Bannion and Hymie Weiss. It would have obviously been a good move to change the name from Manhattan Brewing to Malt Maid with prohibition in full effect. We know that Florence Catherine, the young girl in the photo, was born in 1917. She looks to be about 4 or 5 years old. This would mean the year would be either 1921 or 1922. And clearly it’s the fall, judging by the size of those pumpkins. Having found no mention of local breweries using pumpkins in the beer making process, I contacted John J. Binder, a University of Illinois at Chicago professor, who wrote Al Capone’s Beer Wars in 2017. It is interesting that they would have found their way to Schaumburg Township to purchase pumpkins from Stratford Farms. Given the Farm’s connection to the Stratford Hotel in Chicago, word must have somehow gotten around that the farm provided much of the produce for the hotel–and that it was plentiful. Hence the Malt Maid truck. And the result? A chance for James Austin Bell to take the photo. Given the fact that, per La Susa, “the company’s name was changed to Fort Dearborn Products Co. in 1925,” Malt Maid was indeed a short lived name. Which makes it fairly incredible we have this amazing photo of their appearance in Schaumburg Township! 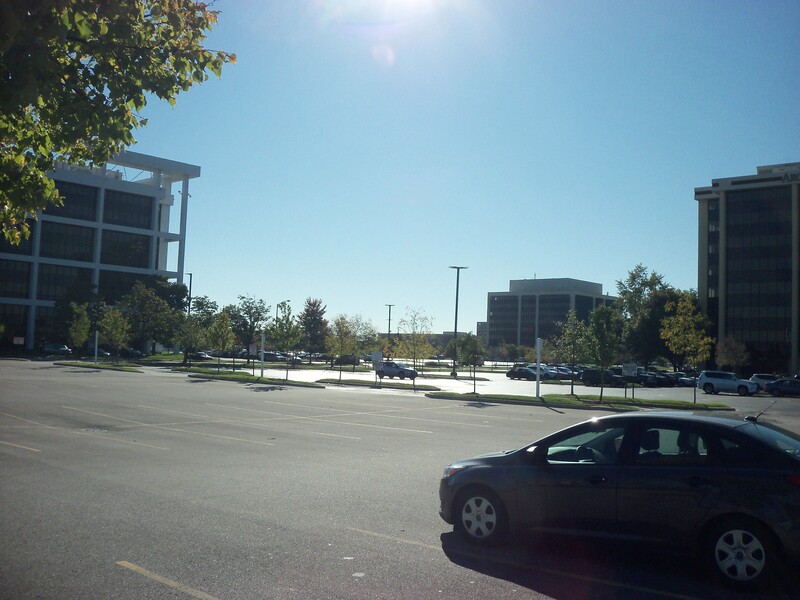 When 999 Plaza Drive was built in Schaumburg in 1977–following its sister buildings that were built in 1974–the entire development was known as Woodfield Office Plaza. 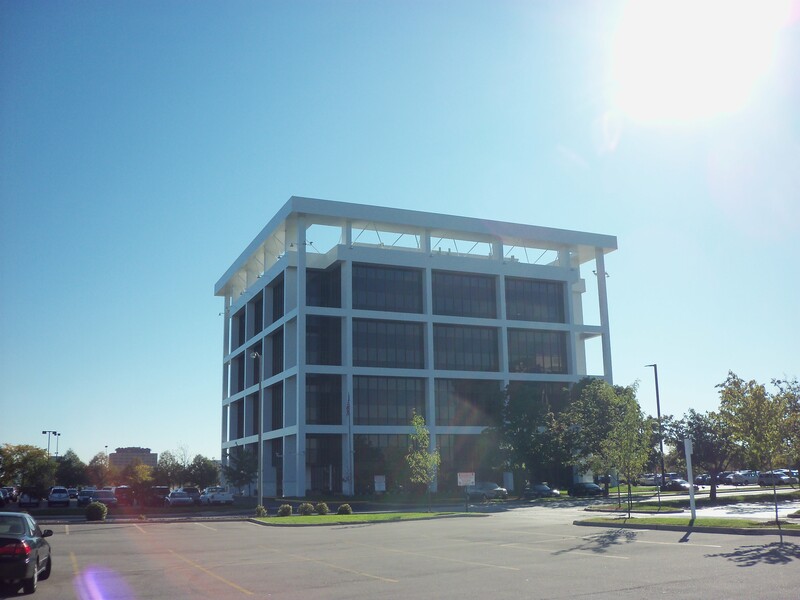 The buildings were part of the 325-acre Woodfield Park which was a commercial project being developed by J. Emil Anderson & Son, Inc. of Des Plaines. In the following photos you can see parts of all of the buildings. 999 is at the back of the photo and 1000 is to the right. This building at 830 N. Meacham Road was in the process of being torn down when I took this photo. The south façade was all that remained. Finished in 1981, this 2 story office building was nestled in a slight valley and surrounded by mature trees. Some of the tenants who were in the building over the years were Gooitech, Associated Milk Producers and Healthcare Financial Resources, Inc. 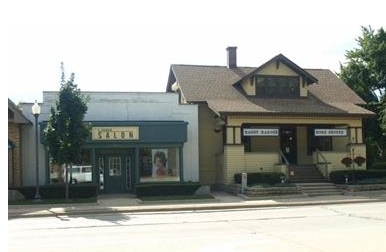 This photo from Google street view shows the building when it was most recently the International Training/Skin Beauty Academy. The site is currently empty. 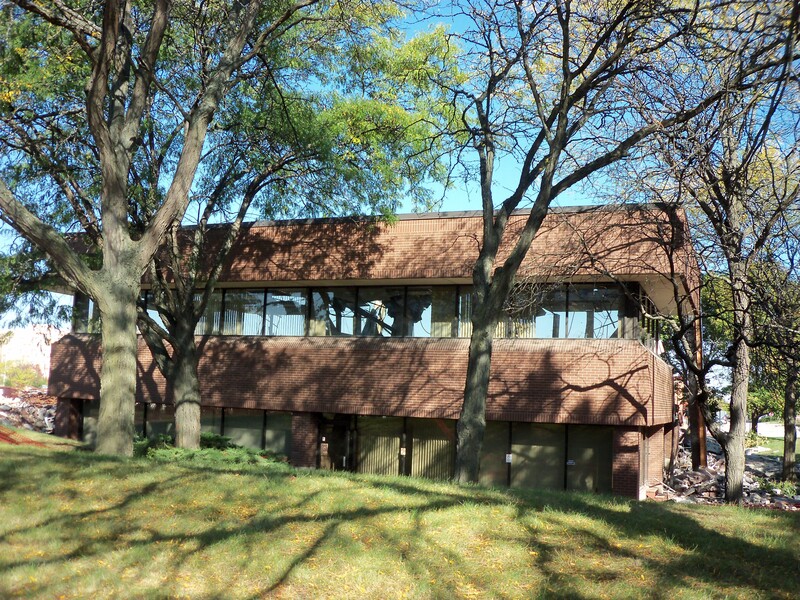 A Modernist style building was built in 1972 on Meacham Road and housed the American Savings Association. 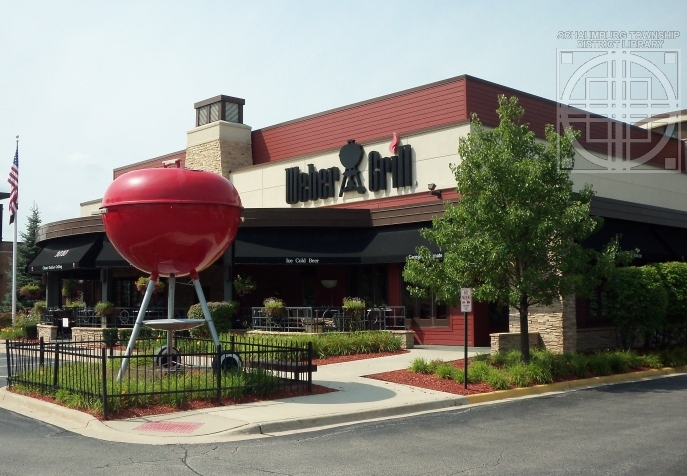 They opened for business on September 29 on the west side of Meacham Road and remained the sole owner until Weber Grill bought the property. The building was demolished to make way for the restaurant that opened in 2005. 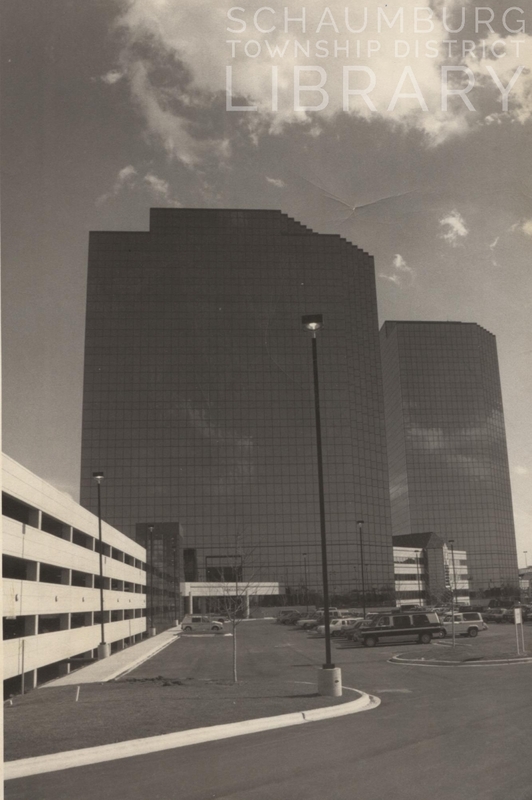 They then purchased Plaza Towers I in 1988 that is located on Plaza Drive and borders Meacham Road. The building is 20 stories and was completed in 1987. In addition to the purchase, Zurich then commissioned the building’s developer, Otis Co., of Northbrook to build a second, identical tower that would also include a second 5-level, 960-car parking deck and a 3-story atrium connecting the two buildings. And here they remained until 2016 when they moved into this incredible building that was constructed on a portion of the Motorola campus. The property borders the Jane Addams Tollway and is truly a spectacular sight–particularly at night. 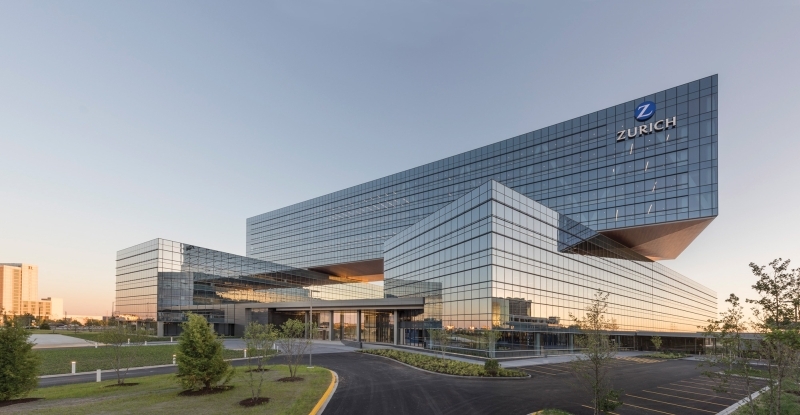 This photo, courtesy of Goettsch Partners who designed the award winning building, shows the three offset bars that make up the sustainable building which earned a LEED Platinum certification. 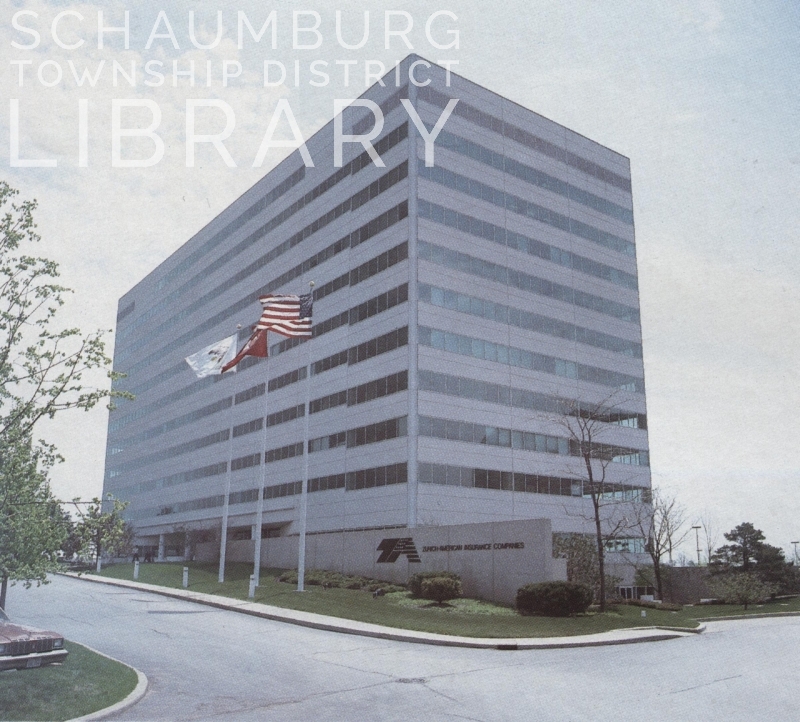 Change will continue in Schaumburg as building and business styles continue to evolve. Some buildings we will miss and others may be an improvement. Getting a visual glimpse of where we began and where we’ve gone over the years is always a nice reminder of how important our local history is.